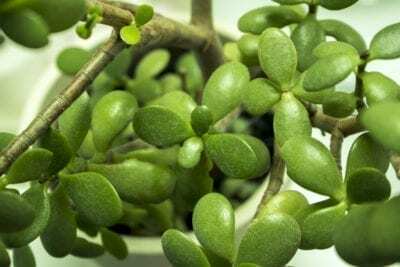 Jade plants, or Crassula ovata, are popular houseplants, beloved by plant enthusiasts because of their stout brown trunks which bear thick, glossy green succulent leaves. They can be formed in to unique bonsai shapes and can grow to about 5 feet (1.5 m.) tall in containers. Generally easy-care, low maintenance plants, there are a few specific jade plant pests that can damage and even kill them if not controlled. Read on for more information on pests of jade plants. The most common of jade plant pests is the mealybug. Mealybugs will form white, cottony patches at the joints where leaves are attached to stems. Their mouth parts pierce into plant tissues and they feed upon the plant sap. As they feed, mealybugs secrete a sticky substance, known as honeydew. This sticky honeydew provides an ideal location for the spores of the fungal disease sooty mold to settle upon. Not only do the jade plants suffer from the sap loss from a mealybug infestation, they often end up with a nasty infection of sooty mold. Mealybugs and other jade plant pests are difficult to control because jade plants can be very sensitive to horticultural soaps and oils. These insecticides can be too harsh on the succulent foliage, causing even more damage to the plant. Instead, it is recommended that mealybugs on jade plants be wiped off with cotton balls or Q-tips soaked with rubbing alcohol. Other common jade insect pests are spider mites and soft scale. Spider mite infestations will cause chlorotic patches or speckling on jade foliage. Again, rubbing alcohol is the recommended treatment for pests of jade plants and horticultural soaps and oils should be avoided. It is important to stay diligent when treating these pests. Mealybugs, soft scale and spider mites are all very small pests that can go unnoticed for quite some time and can easily hide in hard to reach plant surfaces. It may be necessary to clean infected jade plants with rubbing alcohol several times before you’ll finally be rid of these pests. In extreme cases, jade plants with pests may need to be disposed of.